We offer developmentally appropriate athletic programs and clinics to help an emerging athletes realize their full potential. Our programs help athletes improve skill levels and develop the qualities of good sportsmanship, respect, responsibility, and moral integrity as well as develop an appreciation for the value of physical fitness and conditioning. In addition to our fun Under the Stars Summer Camp, we are also offering summer sports camps for Basketball, Football, Field Hockey, and Soccer for summer of 2019! Click here to learn about our summer sports camps, and here to learn more about Under the Stars summer camp! Our Flag Football program is associated with NFL Flag Football and is designed to educate young players about football while emphasizing participation and sportsmanship. Players learn skills and lessons that help them succeed both on and off the field. Practices and games will be held on the outdoor field. Week one is a football combine, week two is a practice with the team, and weeks three through 10 are games against other teams. All teams will play eight officiated games. Every player will receive a reversible jersey from NFL Flag Football at their first game! *Age is determined by child's age as of April 1. Practices and games will be held on the Arena Sports Factory indoor turf field. Join The Arena Sports Factory and the best talent in the area for the 2018/19 Indoor Youth Soccer Season! 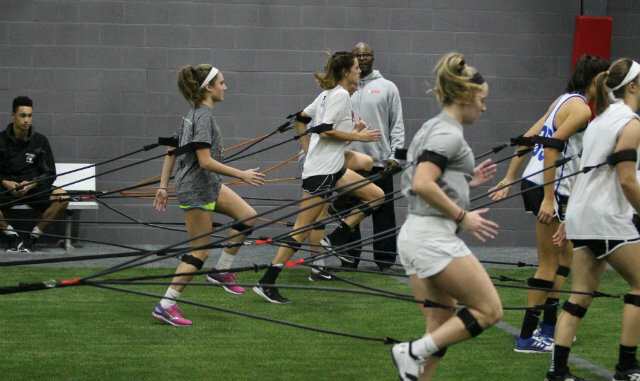 Experience the most elite facility in the Maryland/DC area coupled with the most talented teams that will guarantee a competitive and exciting season of indoor soccer. View all updated league schedules here. The European Football Coaching Talent Identification Program is used to identify players for advanced opportunities in other areas, schools, colleges, countries and academies through solid reputable resources within EFC. Innovative tools such as GPS Technology and visual mapping will be used to test and evaluate players. This program includes on-site speed and agility conditioning with the Sports Factory Strength and Conditioning Team! Ricky Duggal moved to the United States in 2009 after completing his UEFA B license. Along with licenses from England Ricky has also completed the United Soccer Coaches Premier Diploma, Director of Coaching Diploma and was recently accepted onto the master’s license. Ricky brings a wealth of experience having worked with various educators and coaches in other countries as well as colleges while learning and sharing different philosophies, culture and methodologies. As well as being the Director of the Talent Identification program Ricky also works as the Technical Director and Educator for Scholar Athletes Leadership Academy. You can learn more about the European Football Coaching organization here. Join two-time World Champion Coach Krystin Porcella for HS Speed Lax. Coach Porcella has developed a series of drill progressions to help each athlete understand and apply the concepts, therefore gaining confidence on the field. Each Session will be geared toward off season training to keep your athlete advancing her skills to prepare for the Spring 2019 tryouts and season. Players will be group according to level of play and sport comprehension. Each group will advance through the progressions according to ability. Our goal is to challenge each athlete to improve through the course of each Session and feel prepared going into the Spring 2019 Tryouts and season. We will bridge the skills training with Sport Specific Speed training. There is 3 ingredients to help you reach your goals on the field, they are: Stick Skills, Sport Specific Practice and Sports Performance (Athleticism). • Increased Agility: The ability to build side to side quickness in order to find a crease or stick your opponent. • Increase Confidence: Ability to boost your in-game confidence to make quicker split second decisions. Be ready to move faster with your stick than you ever have before! Join two-time World Champion Coach Krystin Porcella for Skills & Drills for Middle School and Elementary School athletes. Coach Porcella has developed a series of drill progressions to help each athlete understand and apply the concepts, therefore gaining confidence on the field. Each Session will be geared toward off season training to keep your athlete advancing her skills to prepare for the Spring 2019 tryouts and season. Coach Janice Rhodes and her team of highly decorated current and former field hockey elites will be conducting field hockey specific drills to improve stick skills, possession skills, and elimination skills. Players of all levels and skills from beginner to advanced are welcome. The program is held on the indoor Multi-Sport Court. The program is offered in two sessions and runs for six weeks on Thursday evenings in two age groups. Janice Rhodes has a long history of field hockey success in Harford County as a player at Aberdeen High School, Harford Community College, and Towson State University in addition to Head Varsity Coach at C. Milton Wright. In 2013, Coach Rhodes led the C. Milton Wright Mustangs to their first and only State Field Hockey title. Along the way, she has been named the Mid-Atlantic Region Coach of the Year, the Varsity Sports Network Coach of the Year, and the Baltimore Sun Co-Coach of the Year all by the National Field Hockey Coaches Association. She has led her Club field hockey teams to numerous Regional and National titles in both indoor and outdoor play. Coach Rhodes has helped develop dozens of young players who have gone on to successfully compete at the next level as collegiate student-athletes. • Improved AGILITY to build side to side quickness to find a crease or stick your opponent. • Improved CONFIDENCE translating to quicker split second decisions on game day. Coach Bellamy has developed a series of drill progressions to help each athlete understand and apply the concepts, therefore gain confidence on the field. Players will be grouped according to level of play and sport comprehension. Each group will advance through the progressions according to ability. Our goal is to challenge each athlete to improve through the course of each session and feel prepared going into the Spring 2019 Tryouts and season. Join boys lacrosse state champion Coach Jason Bellamy for Skills & Drills for Middle School and Elementary School athletes. Coach Bellamy has developed a series of drill progressions to help each athlete understand and apply the concepts, therefore gaining confidence on the field. Each session will be geared toward off season training to keep your athlete advancing his skills to prepare for the Spring 2019 tryouts and season. i2i is an exclusive one-on-one test prep service for students seeking to increase their SAT/ACT test scores anywhere from 100-400 points. Our service grew out of the need for students to achieve score increases quickly and efficiently. We know that every student is different, necessitating unique strategies. We tailor our strategies to maximize students’ strengths and give them the tools to overcome their weaknesses. “The flexibility of the program worked with my complicated sports schedule and the one on one individualized classes helped me increase my scores by over 200 points." For questions and scheduling, contact: Michael Ionescu, Director at info@i2ieducation.com or Call or Text: 443-417-7359. Whether a child is just starting out in recreation sports or moving towards advanced-level playing, we are equipped to help athletes make improvements in both their physical and mental game. Haidong Gumdo is a Korean martial arts instructor focused on sword techniques. As a softer sword art, the practice focuses on multiple attackers, fast and fluid motions, and internal disciplines such as breathing and meditation. Our comprehensive system teaches control of the self through controlling the destructive powers of the sword. Year-Round Swim Team: Arena Club Aquatics is our year-round competitive swim team that competes in the Maryland LSC of USA swimming. The Arena Club Aquatics Swim Team is one of three teams in the state to be nationally recognized with a “Club Excellence” designation from USA Swimming. The award recognized teams that display a commitment to performance excellence. Summer Swim Team: The Summer Starz is a Harford County Swim League, summer team. The team is open to all swimmers 5-18 years old who can swim a length of the pool backstroke and freestyle (meaning without pausing to grab the wall or to tread water). The season runs from the end of May through July, with daily practices and nine meets. Membership at The Arena Club means more than just “joining a gym.” You are joining a community of friends, family, trainers, and instructors who will motivate you and inspire you to reach your health and wellness goals.